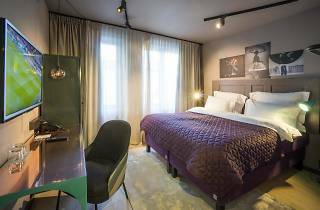 The Story Hotel Signalfabriken, a recent addition to Sundbyberg in north-western Stockholm, is a boutique hotel that thinks outside of the box. 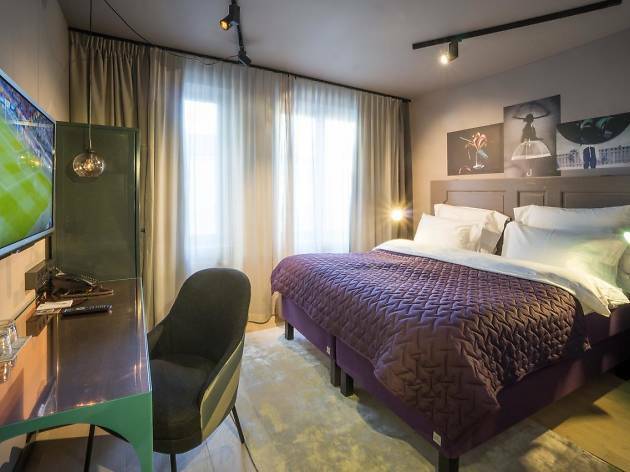 All rooms come with work spaces, rain drop showers, a mini bar filled with complimentary drinks by Vitamin Well and a highly-rated breakfast which offers juices that you couldn’t even imagine. There’s also a popular bar and a branch of the acclaimed Phil’s Burgers in-house. Even better, the double rooms really are doubles here, not just two beds pushed together. For extra comfort, upgrade to the ‘Lagom’ King or Queen rooms (lagom means something like ‘just the right amount’ in Swedish!). The north-west of Stockholm has a new epicenter in Sundbyberg. Major banks and businesses have recently moved their headquarters here, bringing with them a wave of young professionals, alongside cafes to serve them. With a shiny new commuter rail connection that gets you into the centre in under ten minutes, alongside all the trams, buses, metro and regional trains that stop here, Sundbyberg is one of the best-connected suburbs in Stockholm. 1. Signal Fabriken: For shops and bars in a former lamp factory. 2. Marabouparken: For thought-provoking exhibitions by local artists. 3. Delibruket Flatbread: For delicious pizzas and salads in an old water tower.